When the Oklahoma Highway Patrol (OHP) joined the search for a man suspected of killing a sheriff’s deputy earlier this year, the law enforcement agency used ArcGIS Online and Workforce for ArcGIS to properly position more than 100 troopers as the dragnet tightened. “We were able to keep track of all of [the troopers] with Workforce for ArcGIS,” said Captain Ronnie Hampton, commander of the Futures, Capabilities, and Plans Division of OHP. Hampton spoke about his agency’s use of Esri technology during the Esri National Security and Public Safety Summit that was held last July in San Diego, California. All 800 OHP troopers have downloaded the Workforce for ArcGIS mobile app onto their smartphones and enabled location tracking, letting dispatchers see each on-duty officer’s GPS location on a customized Dispatch Map in ArcGIS Online. Workforce for ArcGIS is included at no extra cost in an ArcGIS Online organizational subscription. The troopers and about 90 dispatchers have ArcGIS Online accounts. Hampton said that during the manhunt for the shooting suspect on April 18, 2017, incident commanders could see where each officer was stationed in real time on the map. That locational information helped the commanders decide where to place troopers that were needed for the operation while a search perimeter was set up. “We were able to send in over 100 troopers, sealing off a two-mile area,” Hampton said. “We could see the boots on the ground.” The Oklahoma County Sheriff’s SWAT team captured the suspect later that day after several hours. Staff in all 13 communications centers now use one comprehensive statewide Dispatch Map in ArcGIS Online to keep track of officers’ locations. Application designed by Christopher L. Rogers, Oklahoma Department of Public Safety. Other types of organizations typically use Workforce for ArcGIS to create projects and assign them to staff in the field. Often, the projects involve service, maintenance, and inspection requests or follow-ups to sales leads. 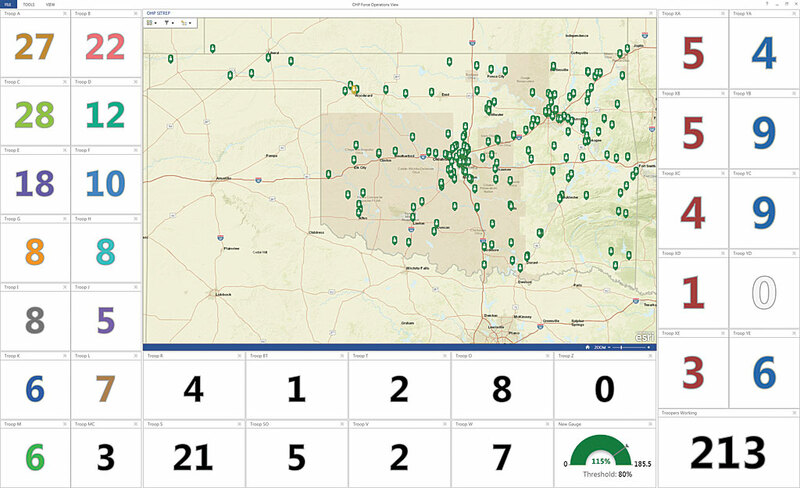 OHP leadership realized the app could provide a critical, real-time view of where all its on-duty troopers were as they patrol more than 111,000 miles of roads and highways, waterways, and the state capitol grounds. The location of each trooper appears as a green icon next to the officer’s call number on the Dispatch Map. Knowing each trooper’s position lets communication center dispatchers instantly send the closest officer to the scene of an accident or other incident. This is a big change. Until Workforce for ArcGIS was launched throughout the organization in the summer of 2016, dispatchers at OHP’s 13 communications centers were only responsible for dispatching troopers assigned to their specific district. For example, if a traffic collision occurred in the district covered by Troop A, only an officer from Troop A would be sent to the scene—even if an officer in Troop B was 20 miles closer, because the dispatcher wouldn’t know the position of officers in other areas. Now, dispatchers can summon anyone on staff to respond to an incident based on their present location. “Our chief requires everybody, including himself, to use Workforce as they commute to work,” Hampton said. “So, everyone in the entire agency is an assignable asset.” Hampton said that OHP chief Ricky G. Adams is very much a champion of technology and keeping people safer. The Force Operations Dashboard shows how many officers are available from each troop and their current locations. Application designed by Christopher L. Rogers, Oklahoma Department of Public Safety. Staff in all 13 communications centers now use one comprehensive statewide Dispatch Map in ArcGIS Online to keep track of officers’ locations. The dispatchers can use the built-in Near Me widget to find the officer closest to the scene of an incident. They also can turn on layers in the map to obtain weather information; traffic conditions; and the locations and phone numbers of police, fire, and ambulance stations. To create the Dispatch Map, the feature data service layer from Workforce for ArcGIS that contains the officers’ locations and green icons was added to ArcGIS Online. Widgets, such as Near Me, Basemap Gallery, Filter, Legend, and Measurement, were added using Web AppBuilder for ArcGIS. Weather data from the National Oceanic and Atmospheric Administration (NOAA) also was brought in, along with traffic information from Esri’s World Traffic Service. 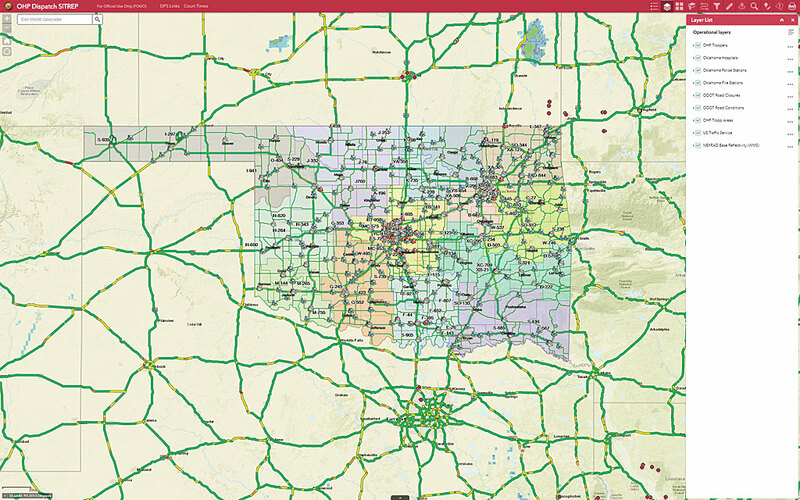 The GPS coordinates for police, fire, and ambulance agencies in Oklahoma and contact information, such as the phone numbers for each agency, were also added to the map. 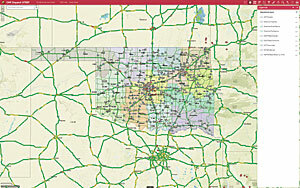 Most of the information and capabilities in the Dispatch Map are available to on-duty officers using the Trooper Field Map in ArcGIS Online, accessible via the computers mounted in their patrol cars. The troopers also have access to useful links on the toolbar that, for instance, retrieve information on court dates for each of Oklahoma’s 77 counties. Troopers also can use tools in ArcGIS Online to set up buffer zones after an accident. When a trucker suffered a heart attack and crashed his vehicle into the beam of a highway underpass, causing a sulfuric acid spill, an OHP lieutenant on the scene used the Create Buffers tool to establish a zone with a half-mile radius around the incident. He shared the map with colleagues so they could block off the area to traffic and onlookers. The agency is using Esri Story Maps apps to share information. This story map shows motorcyclists killed or severely injured in 2015 and presents statistics on whether those riders were wearing helmets. 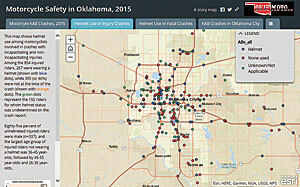 Story map authored by Amy Graham, Oklahoma Highway Safety Office. Workforce for ArcGIS and ArcGIS Online also provide situational awareness for OHP officers. During the pursuit of a suspect on a rural road, a trooper on duty 80 miles away in another county saw where the pursuing officer was located on the Trooper Field Map. When that trooper turned on satellite view, he noticed that the officer in pursuit was coming to a T-intersection and radioed to warn him to slow down. The suspect then veered off into a cow pasture. Continuing to monitor the satellite view, the trooper advised pursuing officers where openings in the pasture’s fencing were located to blockade them and prevent the suspect from escaping. “We caught that guy,” said Hampton. OHP also is putting Esri Story Maps apps to use. 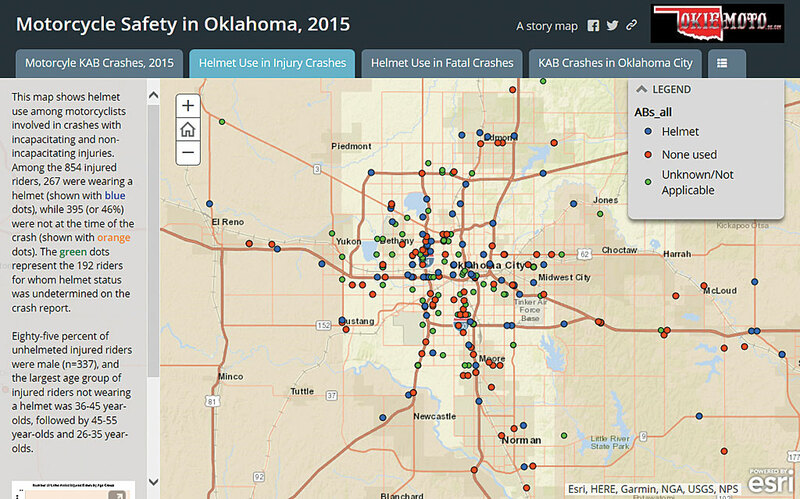 One story map created by the agency shows where in Oklahoma motorcyclists were killed or severely injured in 2015, and presented statistics on how many of those riders had been wearing helmets. Fifty-six percent of the people killed in 2015 in motorcycle accidents were not wearing helmets, according to the story map. Story maps may also be used in the future to document homicide cases that stem from traffic collisions caused by people driving while intoxicated, Hampton said. He thinks they may be useful to the district attorney in explaining to the jury what happened. If OHP collects information from the time the 911 call comes in and documents everything in story maps, it will be easier for an investigator to present the case to the district attorney because all the information will be there. The district attorney can present that story to the jury. In the coming months, OHP also plans to process imagery from some traffic collision scenes using Drone2Map for ArcGIS. Hampton said that OHP plans to initially acquire 13 drones to capture imagery of accidents that block busy roads. “We can’t control cleanup, but we can control how much time we keep the road closed [while] doing the accident reconstruction,” Hampton said. Rather than walking the scene and taking photos and measurements, the drone would take images of the accident aftermath. “With a drone, we can thoroughly document and collect video and photographs of a crash scene in about six minutes,” he said. For more information, contact Captain Ronnie Hampton, commander of the Futures, Capabilities, and Plans Division of OHP at Ronnie.Hampton@dps.ok.gov.